There’s an oldies tune by Archie Bell & The Drells called “Tighten Up.” In that song, the lead singer says “Tighten it up, now, tighten it up.” I was reminded of this song recently when I heard a story about prophetic ministry gone awry. A friend of mine recently told me that, several years ago, a group of people prophesied to them for an extended period of time. I won’t tell you how long, but let’s just say it was a looong time. My friend even got the whole thing on tape! In general, I would say if someone prophesied over me like that, they probably had something great to say. These people might have had something great to say, too. The only problem was: my friend didn’t know if the things they spoke over them were great or not. Because they never gave my friend any interpretations or applications. So my friend left that session not having a clue what they were saying, and definitely not feeling encouraged. Uh, if that had been me, I would probably have been encouraged either. I would have been terribly frustrated; I was frustrated even hearing that story. That story made me think: I want to speak a message to prophetic people across the Body of Christ that we need to be careful. We need to “tighten it up, boys, tighten it up!” Why? 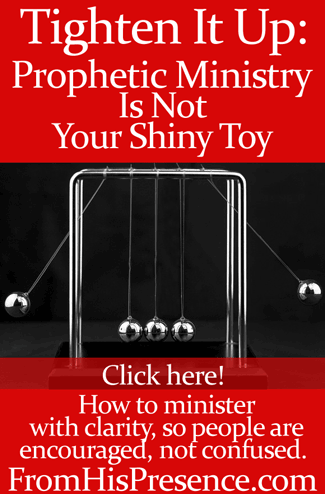 Because prophetic ministry is not our shiny toy. I think we sometimes get so enamored with prophetic ministry that we forget its entire purpose is to edify, encourage, and build up other people. It’s like the gift of prophecy becomes a shiny toy. We like to get it out and play with it, just for the fun of exercising it. However, we forget that its entire purpose is to declare the purposes of God into a person or situation so that His Word can take root and bring change. And yet prophetic people should be well-trained warhorses; crack snipers in the spiritual realm. Maybe we should look at the military for inspiration? In the military, they don’t teach you how to shoot a gun just for the fun of it. They also teach you to hit what you’re aiming at. Shooting a gun without hitting your target is a waste of time. Prophesying without application, translation, and interpretation can be very much like shooting a gun… but without hitting a thing. In the story I relayed above, there was a lot of prophesying going on, but no change seemed to occur. They appear to have been shooting the gun without hitting anything. How much better would it have been if they had shared their mental pictures and visions, then told my friend how to interpret and apply those visions? When you’re prophesying and you see something (vision, mental picture, whatever), don’t be so excited about your vision that you forget to make it useful to the hearer. Ask the Lord for the interpretation and application of whatever you see. If He gives you the interpretation, share it. Image courtesy of Sheila Sund on Flickr via Creative Commons license. Image has been cropped and graphics added.